The Somme front was taken over by British troops from the summer of 1915. 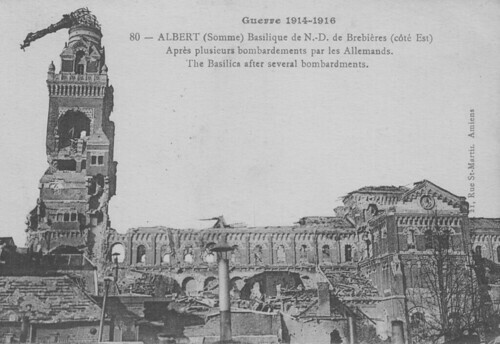 The main town that became their staging post in this sector was Albert, a brick built small industrial town but with a huge basilica. 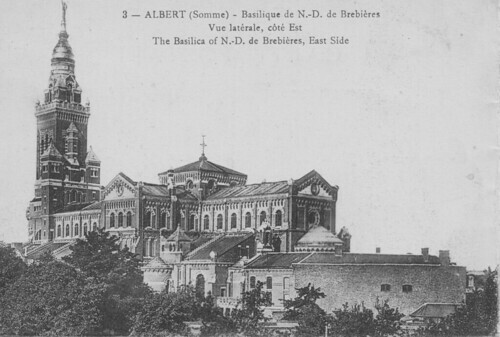 The basilica of Notre Dame de Brebières had only been completed in 1895 but was already a centre of pilgrimage. It’s main tower had been struck by a shell in 1915 and the huge golden figure of the Virgin Mary with her outstretched arms holding the infant Jesus hung at a rather precarious angle. French Engineers wired it up to stopping it falling into the square below and the legend grew that ‘when the Virgin fell, the war would end’. For British troops on the Somme, especially in the lead up to the 1916 Battle when thousands of men arrived, it became a major landmark. The men marched underneath it going to and from the trenches, and could see it from many of the front line positions. Postcard images of it could hardly be produced quickly enough, and were sent home in their sackfulls. Most Tommies called it the ‘Leaning Virgin’ or the ‘Golden Virgin’. When the Australians arrived in July 1916 they had another name for it – Fanny Durack. Durack was an Australian female olympic swimmer who had won a gold medal in the 1912 Olympics. The Diggers thought it looked like Fanny diving into a swimming pool! Destroyed by 1918, the Virgin finally fell to British guns when the town was captured in March 1918. Rebuilt in the 1920s, it still dominates the Somme landscape to this day. This entry was posted on 11/10/2012 by sommecourt. It was filed under WW1 and was tagged with 1916, Albert 80300, Battle of the Somme, Diggers, Fanny Durack, Leaning Virgin, Somme. One of my Great Grandfathers, shot in the face on 1 July 1916 when he went over the top with the 11th Suffolks near Laboisselle, recalled the Golden Virgin as the last thing he saw before falling back into the trench and losing consciousness. That recollection allows us to go back to the spot today and to pinpoint very closely the point where he was shot. I remember reading that the original statue, after it fell, vanished. How something so enormous could have been lost for ever has always intrigued me. I am sure that one day someone will uncover it in their garden!